The Zebra Z-Select 4000D 3.2 mil Receipt is an uncoated, 3.2 mil white direct thermal, receipt paper which produces high-contrast, black images. This material has resistance to image fading, but is not recommended for applications involving long-term exposure to sunlight or extreme heat. Compatible with Zebra QL Series mobile printers. 2.00" x 975.00" direct thermal, 3.2 mil receipt on a 0.75" x 2.25" core. Zebra LD-R2KH5B Mobile Receipt has 36 rolls per case. Special features - Non-perforated. No ribbon required. 3.00" x 975.00" direct thermal, 3.2 mil receipt on a 0.75" x 2.25" core. 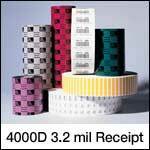 Zebra LD-R3KX5B Mobile Receipt has 36 rolls per case. Special features - Non-perforated. No ribbon required. 4.00" x 975.00" direct thermal, 3.2 mil receipt on a 0.75" x 2.25" core. Zebra LD-R4KN5B Mobile Receipt has 36 rolls per case. Special features - Non-perforated. No ribbon required.